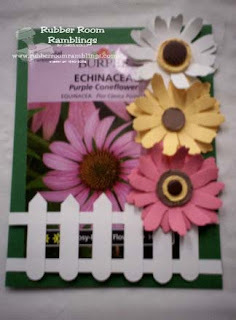 Rubber Room Ramblings: MICHELLE'S SEED PACKET CARD! Here is yet another card from my very talented downline, Michelle Langefeld! She used her Word Window punch to make the little white picket fence. The flowers were made from the Big Shot and she added a different center in each of the flowers. This is the perfect little card for all your gardening friends!